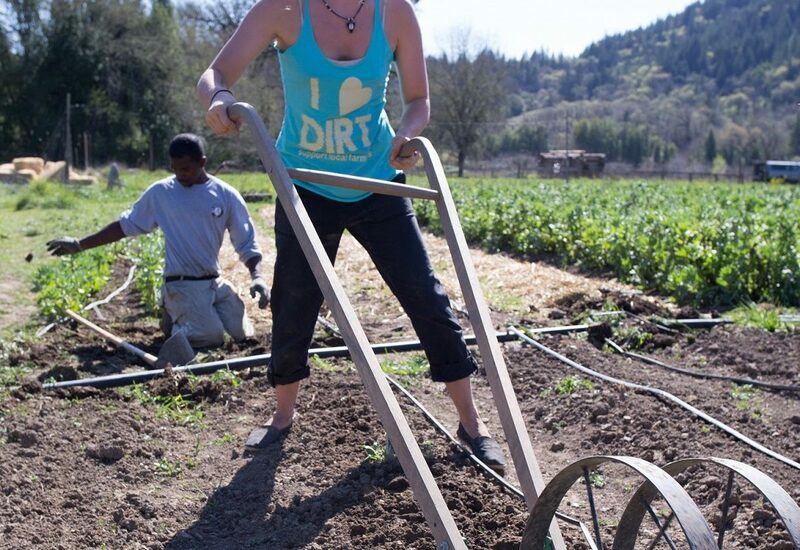 The new Mendocino, California-based Grange Farm School offers an affordable, 3-month training program for aspiring farmers. A group gathers around an outdoor table set with kale salad, speckled bayo beans and rice, and pesto vinaigrette. It’s lunchtime on day four of the first-ever quarter of the Grange Farm School, a new working farm in rural Mendocino County, California, where up to 10 students from around the world live, work, and study on-site for three months at a time. Students engage in 25 hours of “experiential learning” per week, which includes classroom lessons, field trips, building projects, livestock management, and row-crop farming. Accredited through nearby Mendocino College, students pay $3,000 for tuition, room, and board, and receive a certificate as well as four college credits after successful completion of one three-month quarter. Ruthie King, the school’s Director of Operations and Livestock Manager, pulls up a chair at the lunch table, a streak of dirt across her nose from that morning’s hands-on farming class. A major benefit that the Grange Farm School has over other agricultural education programs is that it is a fully functioning, production-scale farm. The farm includes seven acres for pastured poultry and Icelandic sheep, plus row crops—four varieties of millet, dry beans, and diverse vegetables for sale through a nearby food hub. The farm also has a two-acre orchard with apples, pears, and peaches, pollinated by several beehives kept by a volunteer instructor. “What did we observe this morning in the field?” King asks a group of students. She started working on farms immediately after college, including building a dairy operation from scratch. She is young and enthusiastic, and the only thing distinguishing her from the other students is her unassuming authority. When she talks about hatching chicks or eradicating bindweed, her words are informed and inclusive. After all, there is no right way to do most things on a farm. The school centers around a rehabbed 1920’s farmhouse, which includes a living room, classroom, staff housing, and the only flushing toilet on the property. Students have a composting toilet and a large, airy kitchen recently built from historic, salvaged materials and locally milled lumber. Every student also gets his or her own canvas tent cabin on an individual wooden platform overlooking pasture, hills, and forest. With morning farm chores taken care of and lunch tidied up, it’s time for afternoon classes. First up is a short marketing session. Students will be required to write blog entries about their farm school experience; this will increase the online presence of the organization, but more importantly, it will help prepare the students for the realities of what faces them ahead. It’s no longer enough to know how to run a farm. To be successful, farmers also need to learn how to run a business. That’s why the curriculum includes classes in entrepreneurship: sales, marketing, accounting, land access, laws, and regulations. Students also study the industrial arts, such as small engine repair, carpentry, and welding. “We’re trying to help our students think broadly about agriculture and where they might want to fit into it,” says Fundraising Director, School Program Director, and Field Crop Manager Tim Ward. “The goal is for students to find what interests them so they can specialize.” Ward joined the team six months ago as the only other paid employee in addition to King. The blend of instruction and farming was a perfect match for his interests and background, which includes four years’ experience owning and operating a small farm in nearby Anderson Valley and nine years working in youth leadership and farming education. King and Ward have also been supported by volunteers, guest instructors, interns, and the community at large. Take Takashi Yogi, a dedicated volunteer with an engineering background and carpentry, electrical, and design skills. Today he’s teaching “Tools with Takashi” in the tool shed. With the average farmer age rapidly approaching 60, essential land-based knowledge is being lost. According to King, the Grange Farm School “hopes to replenish our diminishing pool of responsible farmers” and, in the process, develop farming techniques that help replenish resources. Student Elisha Allgood echoes King’s urgency, explaining that her interest in farming stems from a desire to be part of the solution to a food system that is doing more harm than good. She was working as a web application designer in Brooklyn when she heard about the Grange Farm School. Applications for the fall quarter are being accepted through July 25. For more information, visit www.grangefarmschool.org. I love this! Keep doing the great work, we need this right now!! Go Practicum Students! June 2015 was the best month of my life!